I have come to the decision that The Perfect Sketchbook...is one I make. I do like stitched bound sketchbooks for special occasions but for an all around workhorse I like my own best! Listed below are the papers and the sizes I use. I use Mi-Teintes by Canson. I prefer creams, grays, and sepia tones. The paper comes in pads or larger sheets. Mi-Teintes can be found at most art supply stores. For a simple cover and backing have spiral bound at an office supply store (Kinko’s, Staples, Office Max…). They provide a light weight cover, backing, and spiral. If you want to get creative with the cover...here's what I do. 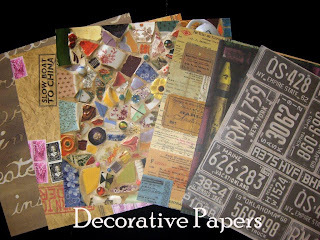 1 Piece decorative paper for cover. Paper should be at least 1 inch larger than sketchbook size. 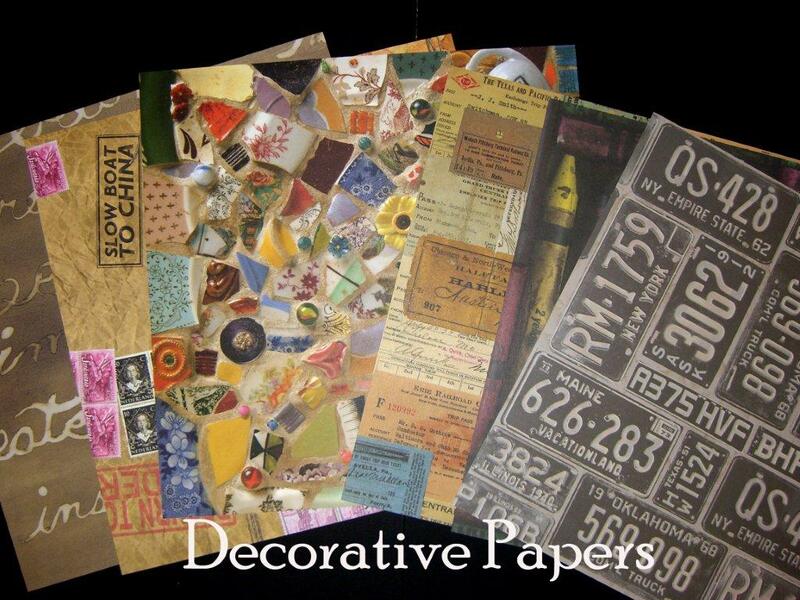 A good resource for decorative papers is scrap booking stores. Papers that are thin should be avoided (tissue or Japanese paper). 1 piece 11x10 stiff backing for back cover. I use thin illustration board, or mat board. Place 11x10 watercolor paper on top of decorative paper (12x11). 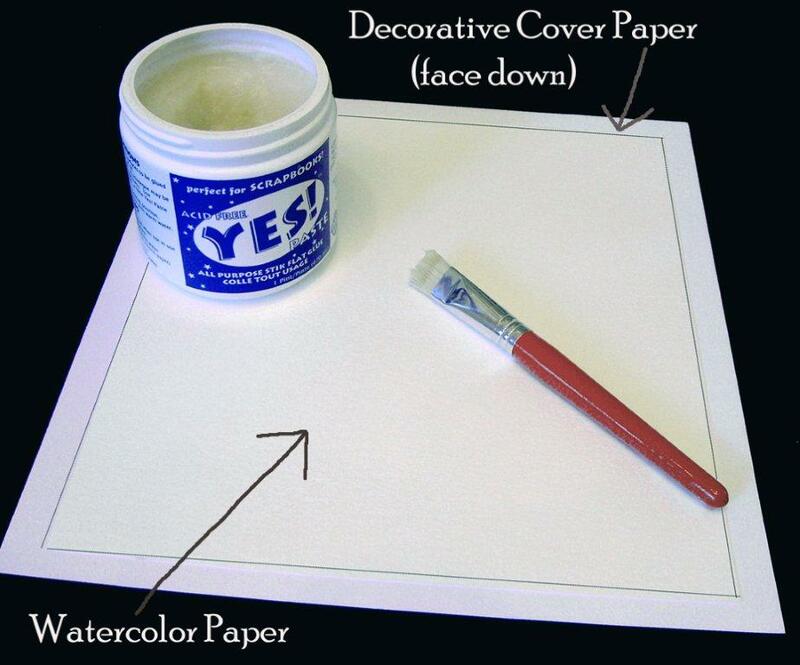 Cover watercolor paper with a light coat of Yes! paste. 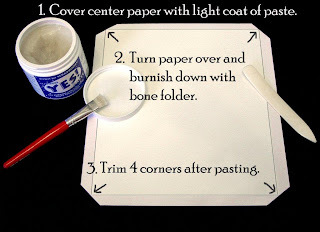 Turn watercolor paper over and burnish down with bone stick. Trim 4 corners as seen in picture. Use paste on 4 flaps, fold over, and burnish down with bone folder. 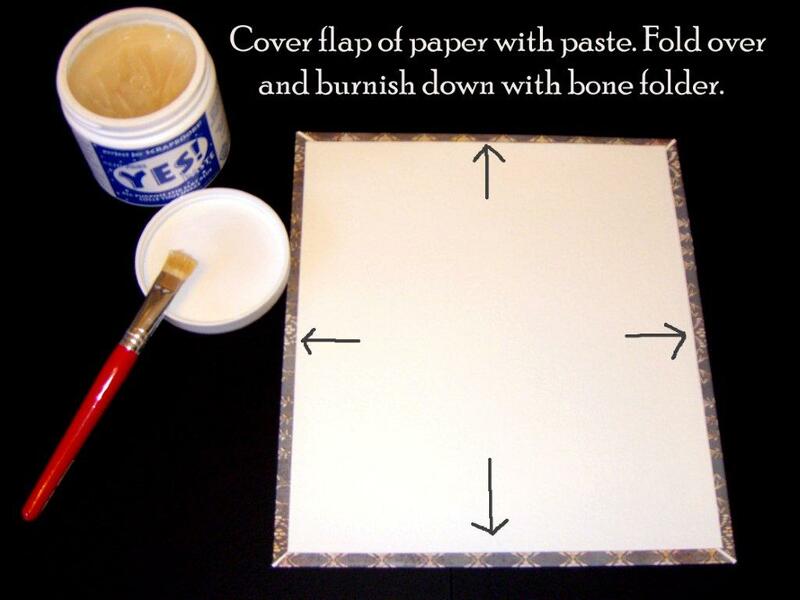 Cover 10½X9½ watercolor paper with a light coat of paste and mount on top of cover (backside). 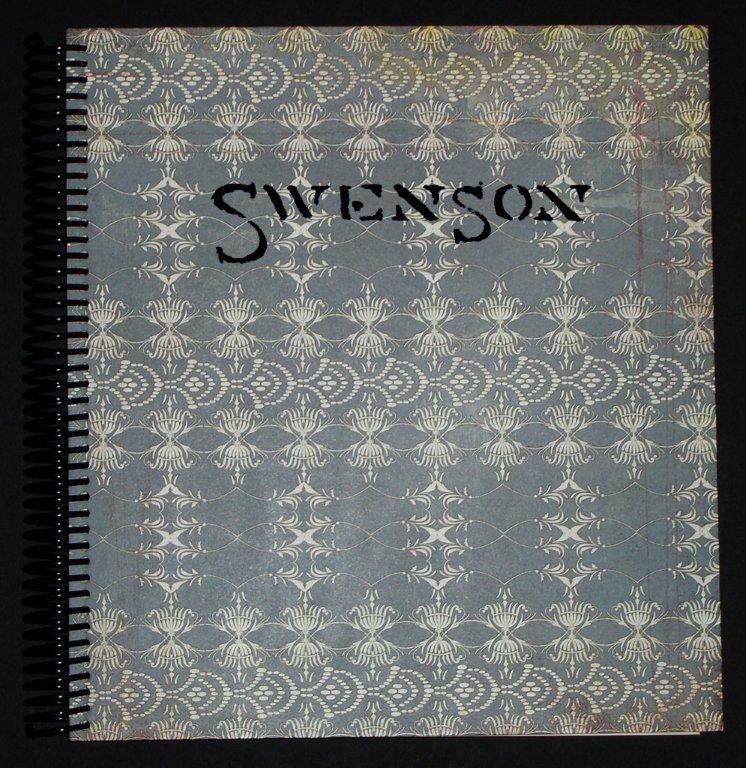 This gives the inside cover a clean look and extra strength. Selection of papers in my sketchbook. The papers where punched with a spiral binder (picture taken before spiral was put on). 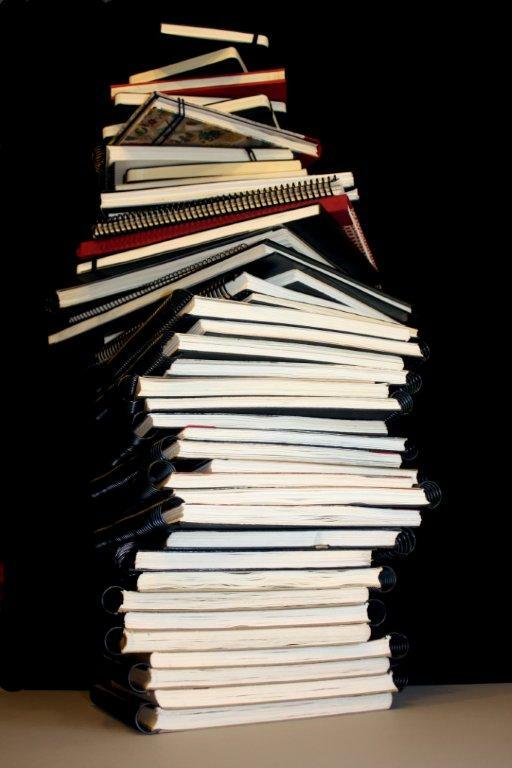 Spiral binding is available at most office supply stores (Kinko’s, Staples, Office Max…). Make a sketchbook fit your own needs. Use any brand of watercolor and drawing paper you like and any size you like. This is wonderful Brenda! Thank you for your encouragement with painting and creativity. Barbara, You're very welcome! Glad you find my blog helpful! Yes, Sketchbooks are very unique, personal and a very wonderful expression of ourselves. I stopped by your blog and you are off to a good start. I wish somewhere you had your name at least the first. It is nice to have a little personal information for readers. You're sketches are delightful! Thank you for telling me about Lizzie Napoli...I plan to do a little research. Hi Brenda, OK, I think I'll be brave & reveal that I am Rita on my blog. I just now posted my 1st entry from my April trip to France with a page from my travel journal. When you are in Provence you might find Lizzie's books in local bookshops. What a great sketchbook! Thanks for sharing. Rita, Many have used my images and don't even give me credit ;/ It's okay if you give credit and provide a link to me. I feel the problem of copyright!. Thank you Brenda for sharing this. Its really helpful. I appreciate your taking the time to explain exactly what papers you put in your sketchbooks. Having the specifics makes it all seem very doable. I've been frustrated lately with finding exactly the right sketchbook, but, after reading your post, I think I just might jump into making my own. And the cover info is very helpful, too. THANK YOU! 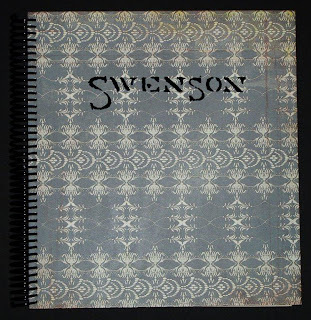 Thanks, Brenda, for the info on making this type of art journal. Question....when I visited Staples, they indicated they couldn't cut anything thicker than my 140# paper to make a spiral. Did I get misinformation? Love your blog and your work. Thank you for going the extra mile to help other artists. I love the fact you make your own sketchbook! I tried for so long to find a great sketchbook in a good size - with really great watercolor paper - but in the end I gave up. I also made my own (you can find it on my website http://www.maximeradesign.se/429960426?i=126252468! I used Fabriano Artistico paper (29,5x27cm when closed), cold press, extra white, 140 Ib, rough. And wow, do I love it! I live in a tiny town in Sweden and I need to purchase all my artist papers and tools on-line - I even bought some from the US. So, thats another reason I try to make my own supplies when possible! Do you have your own paper cutter to cut the large watercolor sheets to the desired sizes or do you use Kinkos or a similar service for that? Also, don't the pages curl and buckle when you paint on them? How o you prevent that from happening? I use a mat cutter for large paper. The paper I use buckles very little. Thank you for your quick response. I have lots of Arches I could use, but it does buckle. I think I will try this. Thanks so much Brenda for sharing. Beautiful work. I just ordered one of your books. 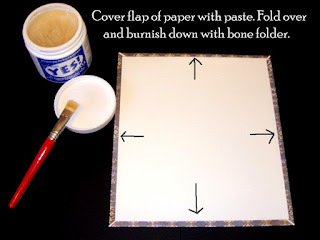 Brenda, I have flat files of odds and ends papers, and this would be a great way to put them to use and allow for experimentation. Do I need to be able to punch these before bringing them in to be bound or is this a part of the service? Thanks! You'll need to cut the papers but they punch and spiral bind. I've been using the Circa system from Levenger. I use a circa hole punch on Arches paper, then cut their covers to size using either the preexisting circa holes or punch my own, then use their discs. I like this system because I can add or take out pages, rearrange and make them to any size I like. 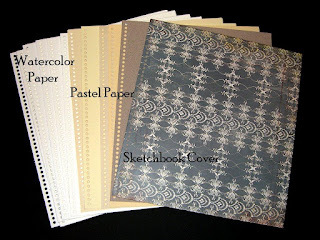 In your description of how you make the sketchbooks, you don't say how or where the pastel paper is used in the book. It's indicated on the perfect sketchbook materials list. Do you paint on the pastel paper and where do you place it in the sketchbook? I've had inquiries from attendees in the workshops I host to have you come do one for us in the future. I'm the workshop coordinator with Pennsylvania Watercolor Society so I may be in touch with you in the future.